Carnegie Mellon was the final stop on Microsoft Corp. founder Bill Gates' recent tour of several nationally recognized universities. 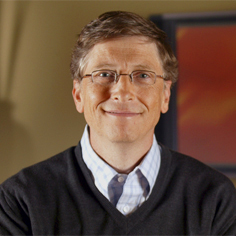 Gates' lecture, "Bill Gates Unplugged: On Software, Innovation, Entrepreneurship and Giving Back," took place Feb. 21, 2008. As founder, chairman and former CEO of Microsoft, Gates revolutionized personal computing in the digital information age. Since 1975, Microsoft has pioneered many of the software solutions that have transformed our world, including MS-DOS, Microsoft Office, Microsoft Windows and Xbox. One of the university's top corporate supporters, Microsoft employs more than 300 Carnegie Mellon alumni in offices around the globe, including corporate vice presidents Harry Shum (CS '96) and Anoop Gupta (MCS '82, '86) and Carnegie Mellon Alumni Board Member Arnold Blinn (MCS '87). Carnegie Mellon is also home to the Microsoft Research-sponsored Center for Computational Thinking, launched in March 2007 in an effort to stimulate collaborative research and educational partnerships. With a lead gift of $20 million, the Bill & Melinda Gates Foundation has made possible the Gates Center, one of two signature buildings that will constitute Carnegie Mellon's new School of Computer Science Complex. The Gates Center will be home to the school's undergraduate programs, featuring classrooms, collaborative work spaces, study rooms and student organization spaces, as well as faculty, graduate student and administrative offices — all designed to achieve at least a LEED Silver rating for sustainable buildings. "My experience as a Carnegie Mellon computer science faculty member showed me how important advances can be made in a highly collaborative, intellectual environment where people are encouraged to voice their thoughts," said Senior Vice President of Microsoft Research Rick Rashid, who gave a sizable gift to the school. "I hope the Rashid Auditorium will be a setting where the vigorous and open exchange of ideas about the future of computing will continue to flourish and I am excited to be supporting the university in this way." Carnegie Mellon is also home to 12 undergraduate and graduate students who are Gates Millennium Scholars. This program was established by the Gates Foundation in 1999 to support higher education for outstanding minority students with significant financial need. With assets totaling close to $40 billion, the Bill & Melinda Gates Foundation is guided by the principle that "every life has equal value." In the United States, the Foundation seeks to ensure that all people — especially those with the fewest resources — have access to education and opportunities to succeed. The Gates family was awarded the Carnegie Medal of Philanthropy in 2001 in recognition of its extraordinary commitment to giving. This award is presented by a consortium of organizations founded by Andrew Carnegie, including Carnegie Mellon University.